Subject: Card and sleeve size? 2. Is there any image shot of the insert? Usually Mayfair games have insert. And can sleeved cards stored on the insert? Is there any image shot of the insert? Usually Mayfair games have insert. And can sleeved cards stored on the insert? What do you mean by not really made for the components? A review of the game could be useful! The game board tiles do not fit in the tray. 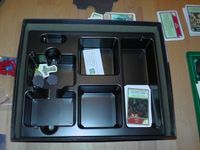 The rest of the components can be stored in the tray including sleeved cards. So, where should you store the map tiles? Actually I store them in that tray there the cards are. And because they are a little bit to wide I put them bent.